Over the last few weeks, I’ve been trying out two new companies who are in the business of helping people eat healthier, reduce food waste, and maybe even save a bit of time and money along the way. Plated and Blue Apron are the two main companies who will deliver all the ingredients (actually, measured ingredients) you need to make a fabulous meal at your home. Each box comes with the exact things you need as well as detailed instructions, including photos, of how to cook the meal. It’s a pretty amazing idea. See, I love to cook, but the act of deciding what to cook, making lists, going to the grocery store, carrying it all home, and then cooking just makes the whole activity of cooking feel like a chore! I already wrote about my experience with Plated and soon I’ll be sharing some insights I had through my experience with Blue Apron. Overall though, one thing that continues to bother me is the amount of waste that I feel like I’m creating due to every single ingredient being individually packaged in Ziploc bags, small containers (similar to a travel size shampoo bottle), boxes, bubble wrap, ice packs, and more. Something about all that waste just makes me feel bad! Actually, my freezer is FULL of ice packs because I thought I’d save them and use them later. But,now half of my freezer is full of ice packs. And, I’m not quite sure how to dispose of them correctly. But, back to the actual ingredients and what bothers me about that. Let’s say I am going to cook 3 meals one week. It’s very possible that each of those meals calls for common ingredients, maybe eggs, or red wine vinegar, or butter. 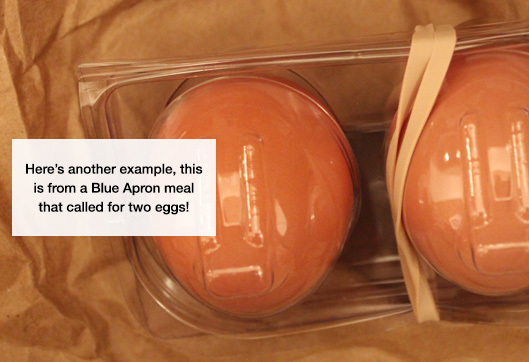 Ok, so here’s what really, really bothers me about Plated and Blue Apron. If one meal calls for a few tablespoons of red wine vinegar and another meal call for red wine vinegar, I receive 2 little plastic bottles of red wine vinegar, measured with the exact amount of red wine vinegar that I need for each meal. This seems very, very, very wasteful to me and it bothers me to the point that I’m still deciding if I’m going to continue using Plated and Blue Apron. I love everything else about the products. But I feel like each delivery produces so much waste! 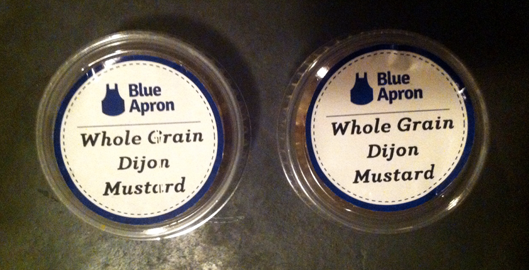 I wish that Plated and Blue Apron had a way for me to only receive “key ingredients” and not receive “pantry items”. By “pantry items” I mean things like red wine vinegar, eggs, butter, olive oil etc. This would be similar to how on Seamless you’re presented with the option to go “green” and not receive utensils, napkins, condiments, etc. So how would you get the pantry items then? Well, it’s pretty simple. Once a month, I could have the option to have a “pantry delivery” where I’d receive a refill on key pantry items. Or maybe I would just buy the pantry items myself at my local market. Or maybe they could partner with food delivery services such as Fresh Direct, Pea Pod, or Instacart so that I could use those services to have my pantry items delivered. Blue Apron and Plated could maybe event set up shopping lists so all I would have to do is login to Fresh Direct or Instacart and enter my credit card information and choose a delivery time! 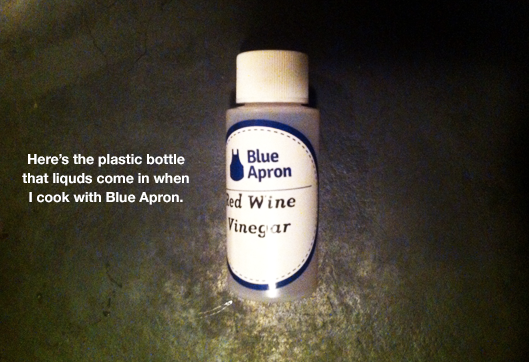 I think this would be a great way to reduce waste from the packaging of duplicate ingredients. As well, this might help with costs for Blue Apron and Plated because they wouldn’t be purchasing packaging (Ziploc bags, bottles for liquids, etc). If you work at Plated or Blue Apron I’d love to hear your thoughts on this. I’m sure you’ve thought about how to make your businesses more environmentally friendly though recycling and such. But as a customer, I still feel like it produces a lot of waste!